Made entirely of un-laminated premium nylon, this custom cap is a 5 panels snapback with flat visor. It features a classic plastic closure also called snapback, thus the name. Fully white except for the front embellishment, the client went for a classic but definitely clean look. 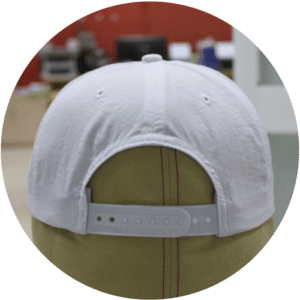 The brand’s logo was placed on the center of the front panels as flat embroidery, a 5 panels is the best way for go for this kind of logos since there is no sewing line running in the middle of the panels. Always keep the specificities of your logos in mind when designing your caps. A white cord was added right above the visor for a classic look. 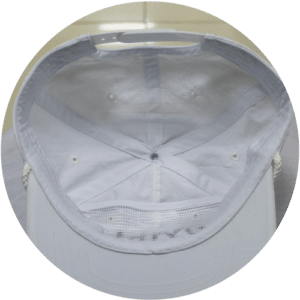 A polyester mesh insert was sewn right behind the front panel to give a bit of structure to this laid back cap. 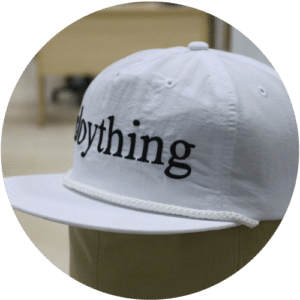 This small detail is essential for custom 5 panels unstructured caps. 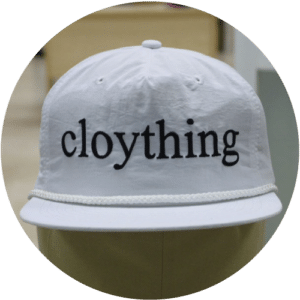 Cloything is a Finish 100% skater owned and operated clothing brand, created in 2011. Their products can be found in retailers all over Scandinavia and beyond. Feel free to check their website to learn more about them.